We’re less than two months away now from seeing Wreck-It Ralph in theaters, and soon, we’ll be able to meet some of the characters from the film in person at Walt Disney World and Disneyland. This November, both parks will be getting brand-new meet-and-greets featuring the film’s characters Wreck-It Ralph and Vanellope Von Schweetz. 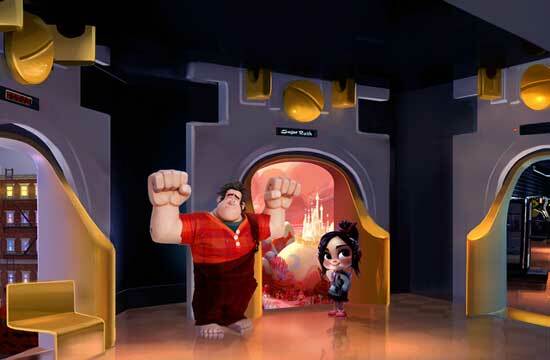 In the new film, Wreck-It Ralph is upset with his life as a villain and decides to leave his video game, traveling through Game Central Station to enter into such new games as “Sugar Rush,” where he meets Vanellope Von Schweetz. The new meet-and-greet in Walt Disney World will give guests the chance to have a short journey of their own, as they will travel through Game Central Station and get glimpses of some of the other video game worlds before ending up in Sugar Rush, where Ralph and Vanellope will be waiting at the finish line. The meet-and-greet will be housed at Disney’s Hollywood Studios at the Magic of Disney Animation. At Disneyland, the meet-and-greet will be housed in the Tomorrowland Starcade. Guests can meet Ralph and Vanellope at the portal to Sugar Rush, and even have a chance to try out on the Ralph’s original game, Fix-It Felix. Wreck-It Ralph debuts in theaters November 2, 2012.